Our History | Retired Men's Association of Greenwich, Inc. 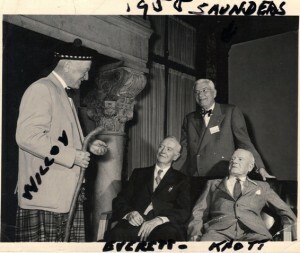 Since 1954, when the Retired Men’s Association (RMA) was first formed in Greenwich, senior men have regularly met in the spirit of fellowship. With goals focused on volunteering, service to the community and building friendships, the RMA has been an association that has drawn retirees together to enjoy one another’s company and learn from the exchange of views. 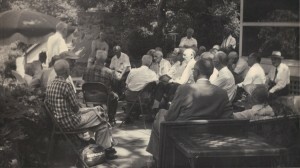 While we are not sure what the men shown in these historic photos of early RMA meetings were discussing, we would not be surprised to find them in easy conversation and listening to the guest speakers which have always been a part of RMA gatherings. We know that those shown at the annual picnic and other RMA activities are no longer with us, yet when our members look at the photos, these early participants appear to reflect the goal of bringing men together in the spirit of camaraderie. Their numbers were smaller then. Today, instead of fewer than 30 men attending meetings, our Wednesday RMA gatherings draw an attendance of between 120-150 individuals. RMA’s earlier members laid the foundations and standards that we follow today.